Hot on the heels of Ubisoft confirming an all-time -high player count last month, Method is proud to announce the signing of our very first Rainbow Six Siege team! 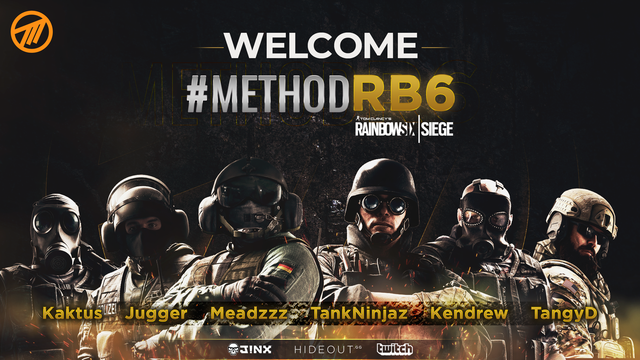 #MethodRB6 features the most U.K.-based players of any squad currently competing in a Rainbow Six Siege Challenger or Pro League. As Team Captain, Connelly been playing since game launch in late 2015, and has previously played in both Pro League and most recently Challenge League - with the goal of sticking firmly back in Pro League with the new Method roster. The growth of the game is projected to keep growing in 2018, with game publisher Ubisoft committing a ton of resources and massive worldwide events already confirmed. To stay up to date with all the Method news, make sure to follow us on Twitter.